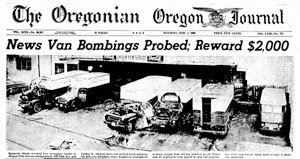 On January 31, 1960 ten trucks belonging to contract haulers for the Oregonian and The Oregon Journal were blown up with dynamite. There was a strike and a lockout going on. The Stereotypers Union went on strike first, followed by almost all the other unions. Levi Sarfield McDonald, a Stereotypers Union collective bargaining negotiator, was ultimately convicted of dynamiting the newspaper service trucks. Several accomplices said he paid them $100 each to participate. Something that was never quite settled was what motivated Levi McDonald, and who paid for the dynamite? The unions condemned the bombing as quickly as the press and public, and even contributed $1000 of the $2000 reward money. Was Levi paid off by someone connected to the unions, or perhaps by someone connected to the papers?